Degas, who always regarded himself as a realist painter, strove to depict the reality around him in his works and chiefly drew inspiration from Parisian life. It is therefore not surprising that he should have developed an interest in the incipient world of shops in the French capital. His visits to fashion boutiques accompanying his friend Mme Straus or the American painter Mary Cassatt led him to paint a group of works that explore haute couture Paris and the world of the new department stores that was brilliantly immortalised by Émile Zola in The Ladies’ Paradise. At the Milliner’s is, as Ronald Pickvance points out, the first in the series of pastel works devoted to the Paris milliners’ shops to be shown publicly at a small exhibition organised by the dealer Paul Durand-Ruel in London in 1882. Even back then it was enthusiastically received by more than one critic, such as the anonymous writer who referred to an “astonishing picture of two fashionable young women trying on bonnets in a milliners’ shop [...]” and underlined how “silk and feather, satin and straw, are indicated swiftly, decisively, with the most brilliant touch.” Shortly afterwards it was sold by Durand-Ruel to Degas’s friend the painter and collector Henri Rouart (1833–1912). The artist uses a markedly diagonal composition that draws attention to the table on which the luxurious hats lie, adorned with red, blue and white trimmings. The exquisite care with which these accessories are painted recalls his delicate manner of rendering dancers’ skirts and headdresses. However, Degas was much more interested in painting people in movement than inanimate objects, and although the hats are granted considerable prominence, the two women in the painting and their gestures and poses are the full focus of his attention. 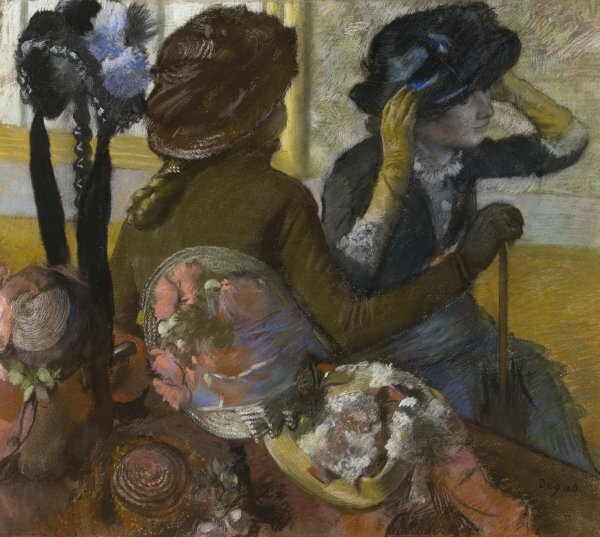 The scene, captured from behind the table in such a way that one of the ladies has her back to the viewer, gazing at the other one who tries on the hat, once again recalls the manner of photographic framing that is so characteristic of Degas. The spectator does not view the shop from outside but is situated inside the room, behind the counter, in the spot where the milliner would be attending to her customers. On the background wall the glass shop window with a gilt frame is the only element that lends depth to the painting while allowing the outside light to enter the shop. Degas replaced the luminosity of the Impressionists, the outside light that envelops the whole painting, with partial illumination or spotlighting that was better suited to the theme of city life.